My previous 1939 Register discoveries gave me some intriguing avenues to investigate as I looked for Uncle Bill and my cousin Madge. I had wondered what became of Grandma's Uncle Bill. Before the 1939 Register, I only knew that he had served in World War 1, and appeared in a couple of group family photos in the 1930s. The 1939 Register hinted that he had married someone called Gertrude and was living in Nottingham, working as a postman. There are four marriages in the Civil Registration index for England and Wales of a William J Field marrying a Gertrude, and one of them is for a marriage that took place in Nottingham in 1919. Thinking this was a likely candidate, I sent off for the marriage certificate. I was in luck! The age matched up exactly, and it said he was a mariner, his residence Brightlingsea in Essex. His father was Henry William Field, another mariner, my gt-gt-grandfather. Obviously a career change was required as not many mariners live in Nottingham, which is about 70 miles from the sea. The marriage certificate alone couldn't tell me how the Essex boy met a Nottingham girl, but it at least confirmed that the William J Field on the 1939 Register definitely is Uncle Bill. The next person to investigate a bit further was my Granddad's Cousin Madge. She'd spent a lot of time in Jamaica, Kenya and Nigeria as her parents – officers in the Salvation Army – travelled abroad to set up schools for people with visual impairments. As I couldn't find Madge Barrell in the marriage index for England and Wales, or even Scotland, I suspected she must have married while she was overseas with her parents. I was lucky enough to find her on the 1939 Register by searching her first name and date of birth, so I then had her married name, Sankey. But her husband isn't on the Register with her, and without their marriage, I had no idea who he was. I looked on the Birth Index for England & Wales and as, from 1911 onward, the mother's maiden name appears in the birth index, I quickly found the births of (perhaps) some children of Madge and her husband. I sent off for one of Madge's children's birth certificates. When it came, it gave me her husband's name, Ronald, and his occupation: "Cocoa Buyer". So several things slotted into place. Firstly, I wouldn't be surprised if Ronald and Madge met in Nigeria, and married there, as Nigeria is a cocoa-producing country. Secondly, Madge is living in Birmingham on the 1939 Register, so it seemed very likely that Ronald was working for Cadbury's, the chocolate company, which is based in the city. 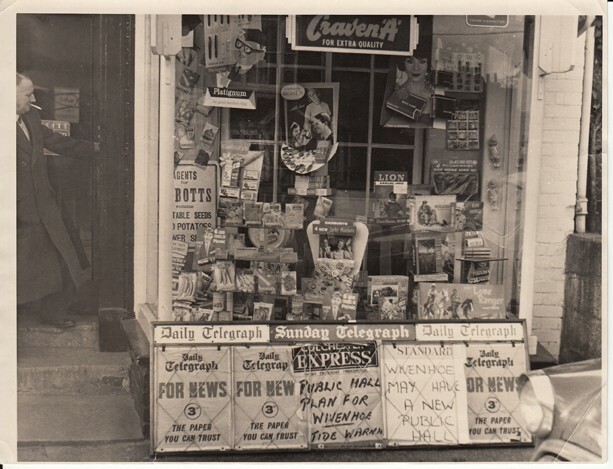 My grandad's paper shop in the 1960s. You can see him on the left of the photo, smoking! Supposing Ronald to be overseas at the time of the 1939 Register, I looked again at Findmypast's travel records, and there he was. He'd boarded a ship called the Apapa from Liverpool to Lagos, Nigeria, on 16th August 1939. No wonder he's not on the 1939 Register, which was taken just 6 weeks later! Even while war raged, Ronald made two more journeys from Britain to Nigeria, in 1940 and 1944. One wonders how dangerous that was, and what risks Ronald took to ensure that the people of Britain wouldn't go without their chocolate. I contacted Cadbury's and their archivist sent me some information on Ronald's time working for the company - a copy of his employee record card, and some articles from the in house magazine. It turns out that Madge gave birth to a child in Nigeria, on New Year's Eve. The Yorubas consider it an auspicious time to be born, and they called the Sankey's baby Abiodun, which means "born on a festival". When I found Madge on the 1939 Register, she was living in the same household as Dora Stone. I wasn't sure if Dora was Madge's relative (and therefore mine too) or not. But when looking for Ronald's trips, I found him travelling to Lagos in 1946 on a ship called Tarkwa, with another cocoa-buyer. This man was called Mr W. E. Stone, who was travelling with his wife, Mrs. D. Stone. It's fairly likely this is Dora, and that she was living with Madge when the 1939 Register was taken because her husband was also overseas buying cocoa when war broke out. I'm so pleased that I've been able to find all this out about Uncle Bill and Cousin Madge, and it's why it's important to use a variety of sources when tracing people in your family tree. Finding people after the 1911 census is quite a challenge, but Civil Registration certificates and travel records – and now the 1939 Register – make it just that little bit easier. *The featured image shows Uncle Bill in the back row, and his dad (wearing a natty sailor cap) in the front row. The other ladies are his sisters (alas, no photo of Gertrude). His dad died in 1941, and based on how the women are dressed, I suspect the photo was taken in the 1930s, and was posed because Bill had come to visit.